A paintball trip was set up by Butters and Fowler so they could release some agression..... and also to shoot seven shades of shingle out of each other and see if America or Britain was best. They ended up staying most of the day and had a great time playing with other parties and also a couple of very enjoyable one on one sessions. A great moment during the day was Butters' baseball style slide-in to win one of the "capture the flag" games. 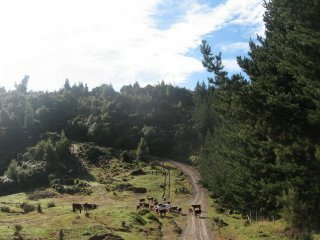 Pictured is the forest where the games were held - and the herd of cows that have just ambushed Butters in the trusty white Toyota.